Patent pending technology provides 100% secure and confidential access to files on the leading cloud storage platforms. Jumble Cloud, a pioneering developer of secure cloud technology, today announced the release of the industry’s first and only 100% secure cloud storage solution. Based on a unique patent pending technology, Jumble Cloud allows users to securely store and share documents, files and enterprise content of any type and size in the cloud. 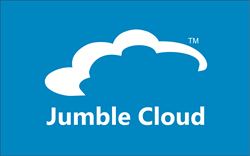 Jumble Cloud is immediately available for free and ready for use with the leading cloud storage providers, including Dropbox, Google Drive, Microsoft One Drive, Amazon Cloud Drive and more to come. Jumble Cloud patent pending technology relies on data encryption systems and a powerful algorithm that dynamically distributes files across the cloud storage providers of your choice. The Jumble Cloud user is the only agent who knows where and on how many storage providers the data is “scrambled” into. This protects information from data breaches and hackers; it is mathematically impossible to reconstruct the original document, even by decrypting the single information packet. Jumble Cloud also goes beyond traditional redundancy techniques to ensure full privacy, security and backup even in the case of data loss or a complete collapse by one of your cloud storage providers. With Jumble Cloud, users are guaranteed complete and full privacy over their data. Jumble Cloud is available for download at http://www.jumblecloud.com. Jumble Cloud is the first technology provider focused on helping consumers and enterprises protect their privacy. Data stored on private or public clouds now benefit from the ultimate security, and may be accessed across all computing devices, including smartphones, tablets and laptops. Founded in 2015, Jumble Cloud is based in Switzerland. Visit us at http://www.jumblecloud.com and follow us on Twitter @JumbleCloud.